"The Taragarh Palace is nestled in the Kangra Valley in Taragarh, Himachal Pradesh. The palace was built as a summer resort and till date is one of the favorite holiday locations. The Palace stands majestically at 1,000 meters above sea level, amidst 15 acres of lush forests and tea gardens. 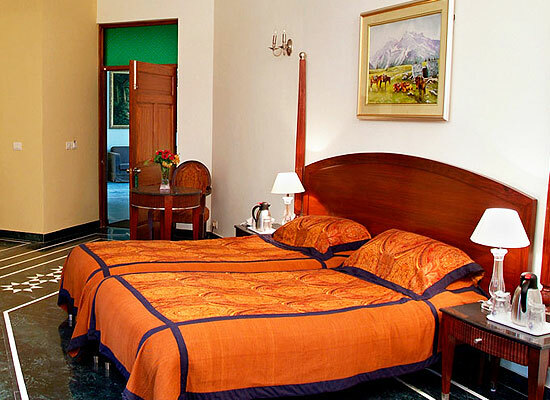 Currently, it is one of the best heritage hotels in Himachal Pradesh. Breathe in the fresh air of mountains. 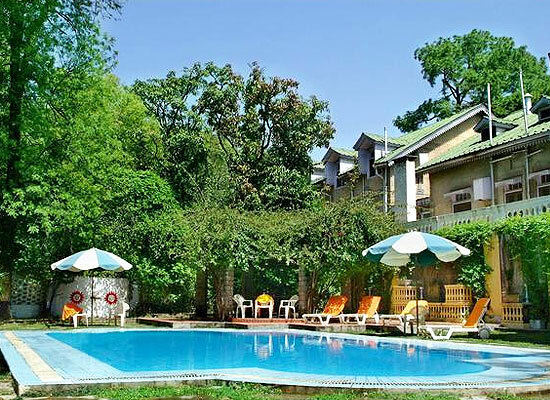 The hotel offers splendid views of the snow-clad ranges of the Dhauladhar Mountains. Enjoy the luxuries of your accommodation. Delicious food appetizes your taste buds. Adventures await in the backyard. The resort is creates refreshing holidays ever experienced. Taragarh Palace, was built by the Nawab of Bhawalpur in 1937. The Palace stands majestically at a height of 1,000 meters, amidst 15 acres of lush forests and tea gardens in the Kangra Valley. The palace was a European-style summer residence. It was acquired by the Royal Family of Jammu & Kashmir in 1951. Developed as a Heritage Hotel in 1971, it is run now by the present royal family. 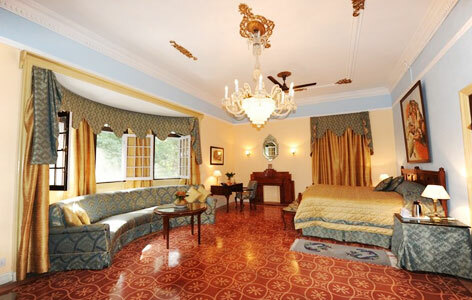 Taragarh Palace offers 26 luxurious accommodations. The elegance of the palace is combined with the latest state-of-the-art amenities. Luxury is combined with functionality, in the 8 suites in Taragarh Palace. Defining elegance, good taste and state-of-the art technology, these suites offer exquisite views of the hills or beautiful gardens. All furnishings and fittings are well designed, easy-to-use and state-of-the art. The 10 super deluxe rooms blend modern comfort with traditional royal elegance that allows you to relax and unwind. 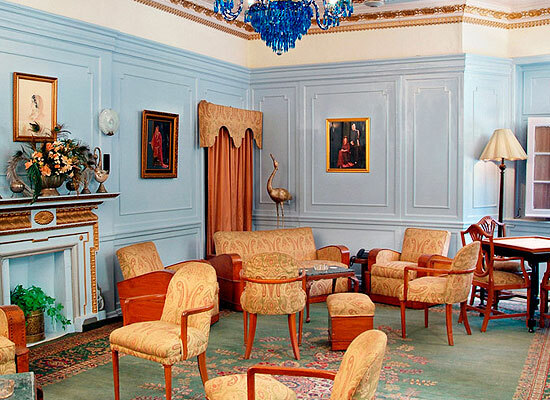 Set in the eminent location in the Palace wing, the rooms have elegant designs. It offers blissful panoramic view of the hills. Unwind in the tranquil setting with up-to-the minute technology on your fingertips. The 8 Deluxe rooms are set in the natural soothing atmosphere with a poise of warm colors. The comfortable and efficient furnishings pamper guests. The rooms are adorned with the magnificent pictures and the colors vibrate in the warm light unfolding into the rooms. These rooms are blend of classy architecture and contemporary luxuries. Guests are pampered to an unforgettable stay . 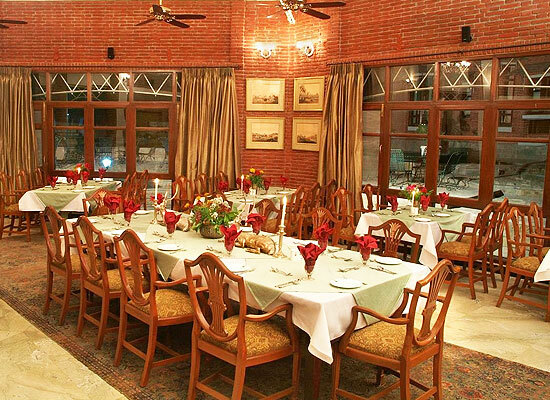 The Imperial dining hall at the Taragarh Palace serves scrumptious delicacies of Indian and popular World fares like Chinese and Continental. The dining hall can accommodate 55 guests at a time. The trained chefs prepare the food with the freshest of ingredients. Snacks and meals are also served at the Patio. Offering a lovely view of the lofty Dhauladhar ranges, Patio is the outdoor seating area where the guests can relish their evening tea and refreshments while enjoying the lovely weather. It is a great place to enjoy some memorable chit chats with your loved ones. Situated at an altitude of 1000 m above sea level, Taragarh in Himachal Pradesh lies on a 15 acre are of tea plantations at the foothills of Dhauladhar Mountains and offers picturesque views of the snow capped peaks. Taragarh is well connected by air, rail and road with important towns and cities in Himachal Pradesh.